Sony on a roll this month. As if I needed any more reason to love Sony. I just found out Sony made the BM10 bluetooth wireless music streamer that is APT-X codec compatible- meaning streaming wireless with my favorite brand! Sigh. I love this company too much. 55 bucks and its a good buy- the Nokia APT-X streamer isn’t made anymore and the Harman Kardon streamer doesn’t support APT-X. Wonderful Sony. The thing with NFC built in is that I can just walk over and pair it when I get home and boom insta- music. And make it do a whole bunch of other things that NFC use dictates one be creative with. 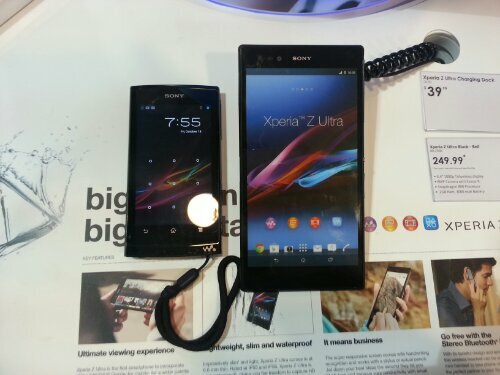 I really liked the Xperia Z in white – with Bell of course. OMFG and what else is with Bell? The Z Ultra. Wtf Rogers how did you lose out on this one. That’s my Walkman Z on the left. 4.3 inches of screen versus the Z Ultra’s 6.4 inces. Dang. I would upgrade to this in a heart beat if this was on Rogers. Previous Post Sony drops a bomb and Thanksgiving Weekend. Next Post Sony IS NOT ON A ROLL. COME ON.